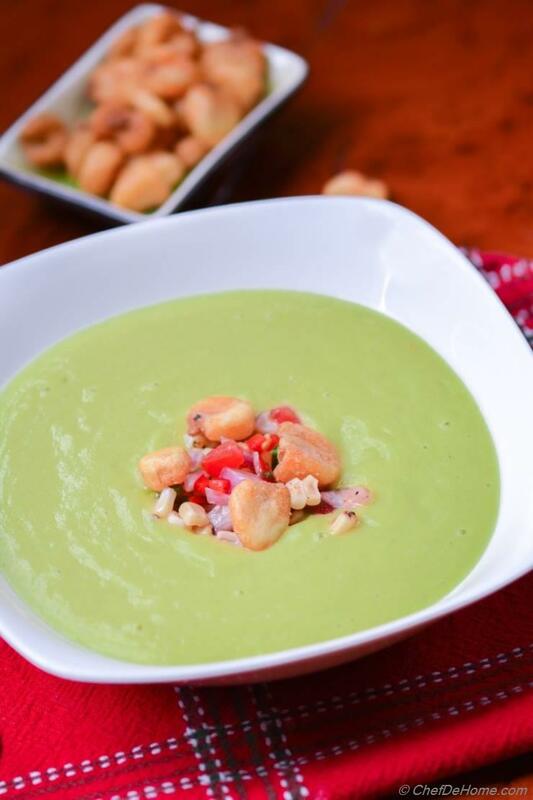 Sharing with you Chilled Avocado and Roasted Corn Soup, a rich and creamy soup, loaded with good-for-you fats yet is vegan and gluten free. 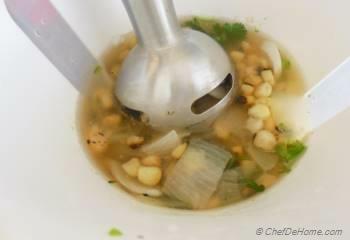 One of my favorite soup to enjoy for lunch on a hot summer day or any given day!!. 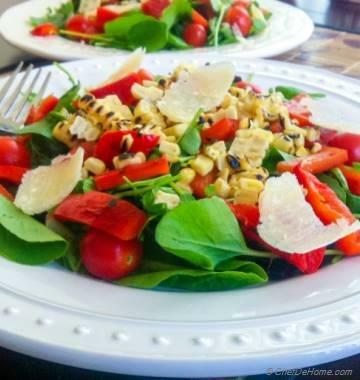 August is corn and tomato season and it is trending on chefdehome. Last week, I shared with you Chili-Lime Roasted Corn Salsa. And we are starting this week with one of my another roasted corn favorite. 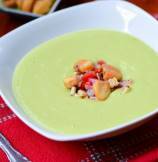 Star of this chilled avocado and corn soup is corn flavored broth. I must tell you that I'm hooked to this broth since I made it first time. Easiest broth to make on this earth!! it takes just 20 minutes to come together and has ton of flavor from roasted sweet corn, garlic, white onion, and cilantro. Trust me, if you make this broth once, you will understand that it can be a great base for many cilantro-corn inspired mexican soups. In-fact, I always make a double batch and use half of it for Vishal's favorite - chicken tortilla soup. We use a lot of garlic and red onion in Indian cooking, but amazingly this broth has just 1 garlic clove and white onion yet sweetness of corn enhances the garlic and onion flavor so nicely. First and foremost, this soup is vegan, gluten free, filling and don't break our daily diet. Bonus - has deep rich flavor to impress tough critic in my family (Vishal is never impressed with rich and creamy soups easily!). Keeping in mind avocado can be little fattening, I have used only one avocado for this 4-servings- soup. It yields 4 cups. About 1 cup soup with good portion of salsa on the top is sufficiently filling serving. So, you only eat 1/4 of an avocado per person and there are no other oil(s) or cream added as well. pretty awesome!! isn't it? You can add few pieces of roasted/fried giant corn or tortilla strips for some crunch, but I leave that choice on you. 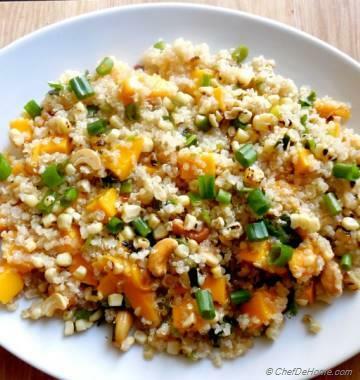 Glad to share this recipe with you. Enjoy some for dinner or pack some for lunch tomorrow! 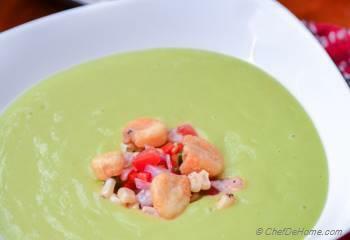 Smart Swap Replace avocado with cucumber for less creamy yet fresh and lite summer soup. 1. Roast corn on rack of gas burner over high heat, turning occasionally with tongs, until kernels are charred in spots, 4 to 5 minutes. Transfer corn to a cutting board and, when cool enough to handle, cut kernels from cob with a sharp knife, then cut cob into half. don't discard cob, we will use it to flavor the broth. 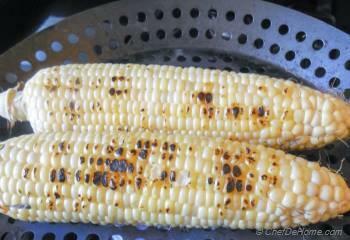 I roasted two corn in shown picture since I used one to make salsa to accompany the soup. 2. 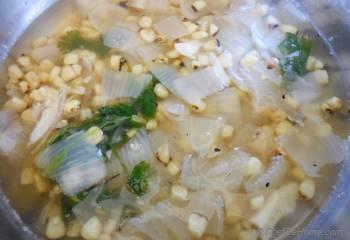 In a deep pot, add corn kernels, cob pieces, water, garlic (smashed), 1/2 tsp salt, and 1/2 of the onion pieces.Bring to boil then reduce heat and simmer until broth reduced to 3/4 i.e. about 3 cup remains, (takes 18-20 minutes simmering). 3. 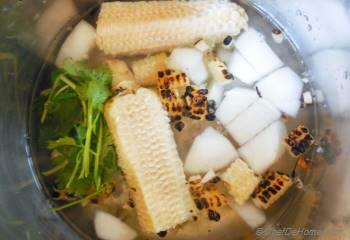 Remove from heat, discard cobs and let broth cool down a little. 4. When cool enough to handle, puree broth mixture using a hand/immersion blender with remaining white onion, and serrano pepper. 5. Pour through a sieve into a bowl, pressing then discard solid remains in sieve. 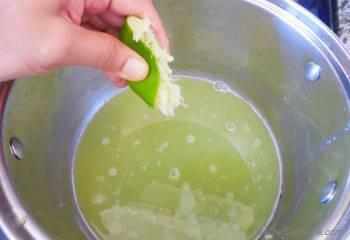 Add 1-2 tbsp fresh lime juice and 1 avocado. Puree the broth again using a clean blender. 6. Transfer to a bowl, cover and let chill in refrigerator at-least 1 hour. While soup is chilling, make salsa. 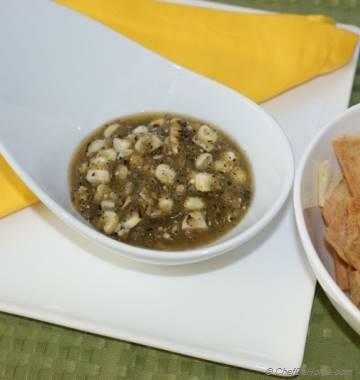 Follow the recipe given in suggestions above to make fresh salsa at home. Serve soup chilled topped with salsa and fried giant corn for some crunch. Instead of corn salsa, small dice ½ cup strawberries, add ½ tsp sugar, ¼ tsp salt. Mix and leave aside while soup is chilling. Serve topped with strawberries for some sweetness. 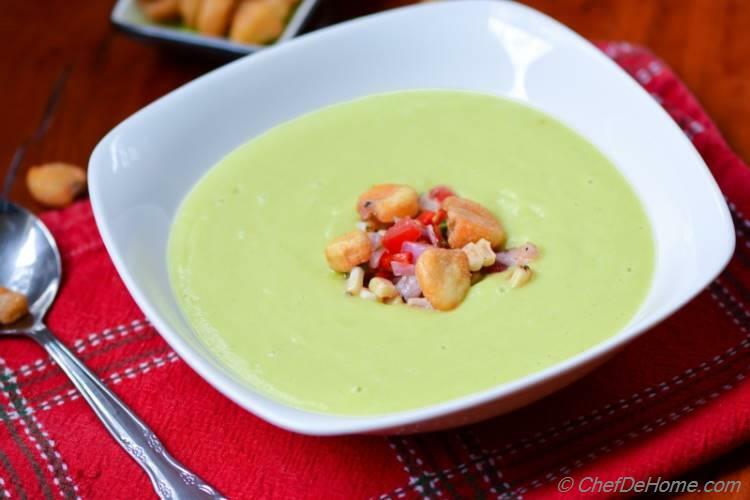 Macerated strawberries taste great with rich and creamy avocado soup. Soup is Paleo, just skip fried and dried corn garnish. I don't like Avocado, but this soup! I have to try! thanks Brijesh, glad you like it! Healthy soup, good idea, thanks for sharing!